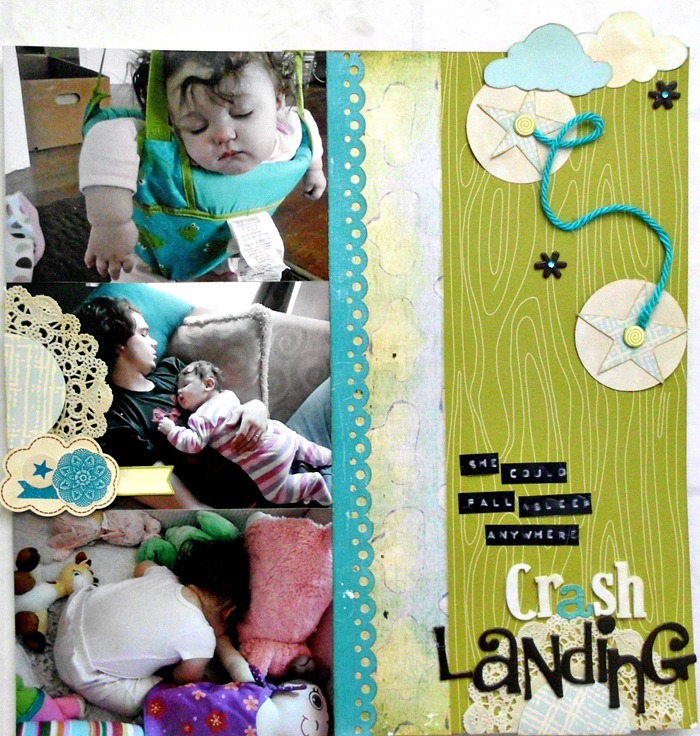 I did this layout for a color challenge over at Two Peas In a Bucket. I LOVED working with the blues, greens, and teals. Having a one year old daughter, it isn't often that I get to play with any colors but pink and purple. 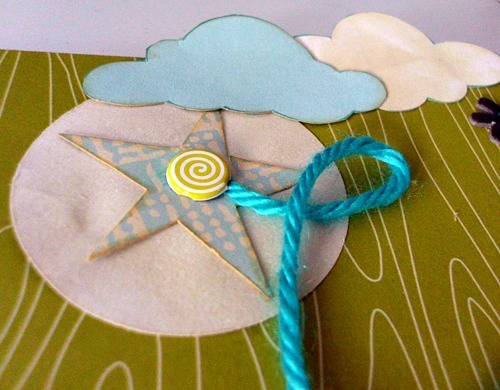 The green wood grain paper is from American Crafts/Amy Tangerine. The pattern paper that the stars (and center of doilies) are made of is actually from American Craft's Night Fall collection. You'd never guess that it had pumpkins on the other side of it! The water color-esque cloud border is from the On A Whimsy collection by Fancy Pants Designs. 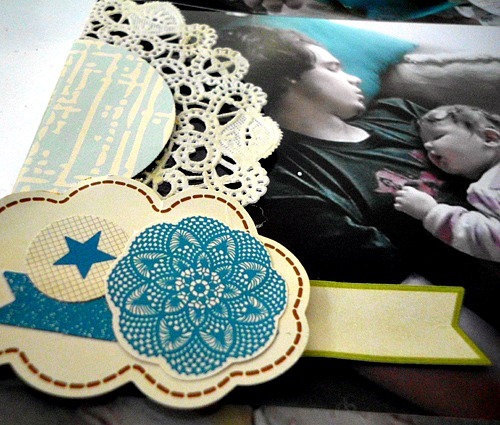 The dark teal border strip was punched out of coordinating paper from the Happy Days collection by Echo Park using a Martha Stewart Scallop Dot punch. I cut the clouds at the top out of paper from Echo Park's Summer Days collection. The cluster of embellishments that are on the picture are all by Amy Tangerine except for the tiny little banner, which is a label sticker from Jillibean Soup. The stars were hand drawn and cut out. I used lolli pop brads (I just broke off the 'stick') to put in the center of the stars to hold the yarn in place. The brown stars are actually asterisks from a set of my Thickers. I just added a bit of bling in the middle of them. The title is a mixture of Thickers, EK Success Alphas, and letter sticks by Crate Paper (Emma's Shop). I did the journaling using my Dymo Label maker. It says "She could fall asleep anywhere." which is so very true. If you take a look at the pictures you'll see that my daughter falls asleep in the most odd positions. Bent over, standing up. If she is tired then she is crashing! It doesn't matter where she is at or what she is doing. So fun! Love this collection of photos and the way you put the colors to work! Love the way you did this layout. Sweet photos.